This page will walk through Angular CanLoad route guard example. CanLoad guard is used to decide if a module can be loaded or not configured with loadChildren property. CanLoad is an interface with canLoad method. To use CanLoad guard we need to create a service by implementing CanLoad interface and override its canLoad method. Then that service will be configured with canLoad property in route configuration with loadChildren. When canLoad method of our service returns true then the feature module protected by canLoad will be lazy loaded otherwise it will not be loaded. CanLoad takes precedence on preloading and preloading is blocked by CanLoad guard. Modules protected by CanLoad has no effect of preloading configuration. Here on this page we will protect a feature module using CanLoad guard and allow to load it only after user authentication. We will also provide example for how to use CanLoad and CanActivate guard together. Now find the complete example step by step. CanLoad is a route guard to decide if a module can be loaded configured with loadChildren property. loadChildren property is a reference to lazy loaded child routes. If a feature module is protected with CanLoad and also it is configured for preloading then CanLoad has precedence over preloading and that feature module will not be preloaded. Find the structure of CanLoad from Angular doc. We will create a service implementing CanLoad interface and override canLoad method. Now using canLoad property we guard loading of modules. When Angular try to access a module protected by CanLoad either by preloading or lazy loading, then canLoad method of our service will run. If canLoad method of our service returns true then that module will start loading otherwise it will not be loaded. To achieve can load we can also use a function with canLoad method signature. Find the steps to use CanLoad route guard. Step-1: Create a service implementing CanLoad interface and override canLoad method. Here we will protect module loading for unauthenticated user. We are creating a service AuthGuardService as following. If user is already logged-in, canLoad method will return true in the above code and protected module will be applicable to be loaded by lazy loading. If user is not logged-in, then user will be redirected to login page and canLoad method will return false and protected module will not be loaded even by preloading. Step-2: Configure AuthGuardService with canLoad property in route configuration as following in application routing module. Our application routing module will look like as following. Step-3: Configure AuthGuardService in providers metadata as following. Now we are ready with CanLoad route guard. In our route configuration we have configured PreloadAllModules strategy for modules preloading. When the application starts, we will see that AddressModule will be preloaded but AdminModule will not be preloaded because it is protected by CanLoad route guard. When we try to access admin feature, we will be redirected to login page and once we are successfully logged-in, then AdminModule will start loading. If user is logged-out, still user can access the admin feature because AdminModule is already loaded. CanLoad protects a module to be loaded but once module is loaded then CanLoad guard will do nothing. Suppose we have protected a module loading using CanLoad guard for unauthenticated user. When user is logged-in then that module will be applicable to be loaded and we will be able to navigate children paths configured by that module. But when user is logged-out, still user will be able to navigate those children paths because module is already loaded. In this case if we want to protect children paths from unauthorized users, we also need to use CanActivate guard. As we have already created a service AuthGuardService for CanLoad, we will also add code for CanActivate in it. Find the AuthGuardService class. In AppRoutingModule we have already configured AuthGuardService with canLoad property as given below. Now we will configure AuthGuardService with canActivate property in AdminRoutingModule that is routing module of feature module AdminModule. Find the code. Find the project structure of demo application. To run the application, find the steps. 2. Use downloaded src in your Angular CLI application. To install Angular CLI, find the link. We will get dashboard. Now access admin feature, we will be redirected to login page. 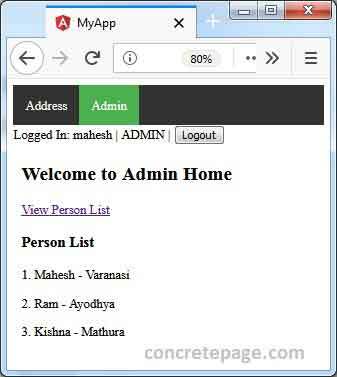 Enter mahesh/m123 authentication and then we will be able to visit admin feature. Find the print screen of the output.